This is an incredible promise and inspiring plea, especially for these times in which many souls throughout the world fail to come to Jesus either in prayer or in worship or in the Sacraments. By means of His image Jesus can be taken to them, and in a very real way. His promise is to touch hearts and fill them with His grace, something that has been witnessed from the time the Image was first publicly displayed and continues to this day. 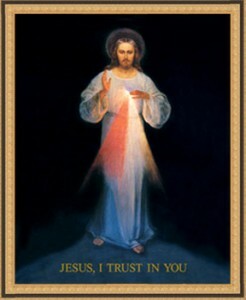 Today there are many versions of the Image of The Divine Mercy. All may be a vehicle of grace for those who revere them with trust. The image presented on this site is known as the Vilnius Image. It was painted in 1934 in Vilnius (then Poland, now Lithuania) by artist Eugene Kazimirowski who had been hired by St. Faustina’s spiritual director Blessed Fr. Michael Sopocko. This is the only image painted under the explicit direction of St. Faustina. At times The Divine Mercy showed her exactly what He meant. [June 20, 1935] Once, the image was being exhibited over the altar during the Corpus Christi procession. When the priest exposed the Blessed Sacrament, and the choir began to sing, the rays from the image pierced the Sacred Host and spread out all over the world. The rays extending from the Image to the Host, rather than from the Host to the Image, suggests the True Presence of Jesus in the Image. The Icon is the portal or doorway through which the heavenly graces flow. In this example we see the graces as they come from Jesus and are magnified by the Sacred Host to cover the entire world. We should now know the importance of having this image available to all and for it to be publicly venerated. Although most of us will not enjoy the same visions St. Faustina had of the Image of Mercy, many today have been amazed to witness the correlation between the Vilnius Image and the Shroud of Turin. The Shroud of Turin is believed to be the burial cloth of Jesus. In the mid 1990’s it was discovered that the two images are proportionately exact. According to leading Shroud authority Dr. John Jackson, a five percent difference in size has been measured in the hair, the shoulders, the chest, and even the fingers. Since the Divine Mercy Image was painted solely under the direction of St. Faustina, without any reference or image of the Shroud involved, the correlation is nothing less than amazing. World-renowned Divine Mercy authority, Father Seraphim Michalenko, MIC, explains that it is theologically sound for the two images to be so related. Each image is of the same Person, Jesus the Christ and these two images together form a dramatic portrayal of the very core of our faith, the belief in the Passion, Death, Resurrection and Mercy of Jesus. The depiction of this phenomenon has been a highlight of many Divine Mercy presentations by Mother of Mercy Messengers. Many are moved to tears as the Lord is seen passing from His passion and death as revealed in the Shroud back to life in His glorified body as Jesus, The Divine Mercy. The power and meaning of the Resurrection comes to light and it becomes clear that Jesus is as alive today as He was 2000 years ago. His gaze is one of love and tenderness and His desire is to touch each and every one of us. After these words, I felt strangely at peace, and I was quite sure that, despite the difficulties, the waters of Holy Baptism would be poured upon her soul. That night, when she was very low, I got out of bed three times to see her, watching for the right moment to give her this grace. The next morning, she seemed to feel a little better. In the afternoon her last moment began to approach. The Sister who was her nurse said that Baptism would be difficult because they were with her. The moment came when the sick woman began to lose consciousness, and as a result, in order to save her, they began to run about; some [went] to fetch the doctor, while others went off in other directions to find help. Since St. Faustina’ time, no doubt millions have received grace from the Image of Divine Mercy, and they continue to do so. Let Every Soul have Access to It. We all have family members, friends, co-workers and neighbors that we may have a difficult time reaching out to and sharing the Faith with. Sometimes they shut us out and don’t want to hear about God or about going to church or confession any more from us. Other times we may not know how to help or what to say. We may not even know the person or family, so what can you do? Share the Image of The Divine Mercy with them.